So you’ve been coming to BenchSci when you need to find an antibody to use in your experiment. But have you considered all of the other neat ways you can leverage the data on the platform? By collecting all the relational associations between antibody products and the experimental contexts in which they were used, scientists can derive insights from all of the data combined. 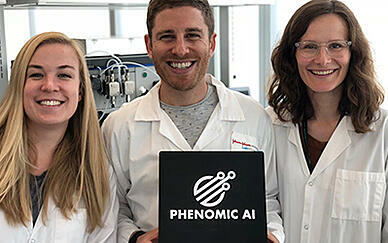 This article shows you how scientists are using the BenchSci platform in novel and innovative ways to gain competitive insights and speed up their research projects. You can actually use BenchSci at every stage of the research process: during your initial literature search, when designing your experiments, and afterwards to benchmark your results. 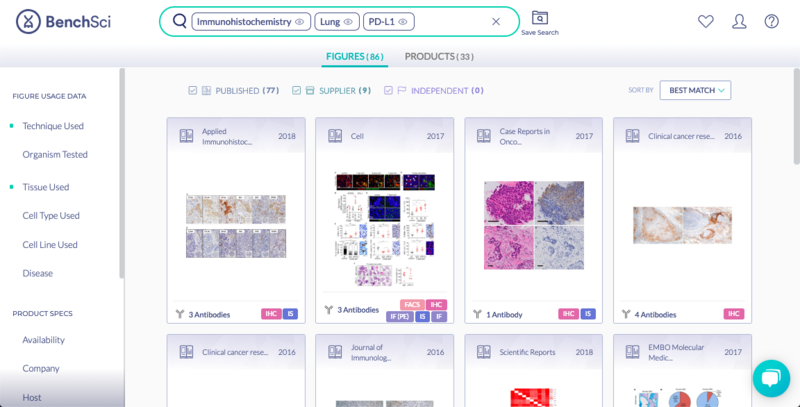 When you‘re starting to study a new protein, you can use BenchSci to discover literature-wide trends, and also get more granular with your literature search using our filters and figure-centric approach to result display. First, you can type your protein of interest into the search bar, and open our filters to see how the protein is commonly studied. Because the entries in each filter are ranked by the number of published figures, the most commonly used option will be at the top of the filter. 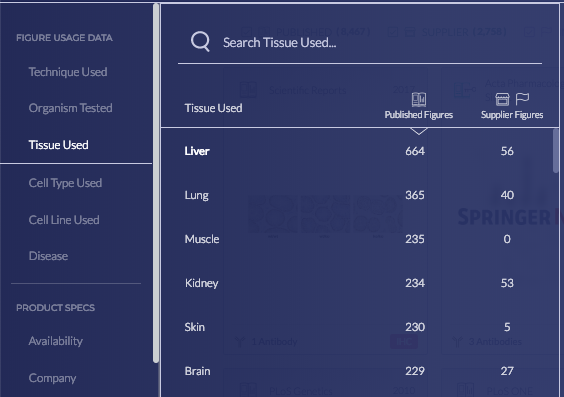 For example, by opening up the tissue filter you can see which tissue the protein is studied in most often—same for cell lines and cell types. If you open up the disease filter, you can also gain insights into the diseases your protein is associated with. If you want to investigate any of these associations further, go ahead and apply the filter to review the resulting images. Keep an eye on our blog and the platform for more news about the KO/KD/OE data coming soon! 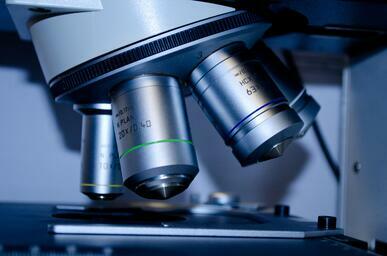 After your literature search, you can move on to designing your own experiments. In addition to assisting with antibody selection, BenchSci can also help with other aspects of experimental design. 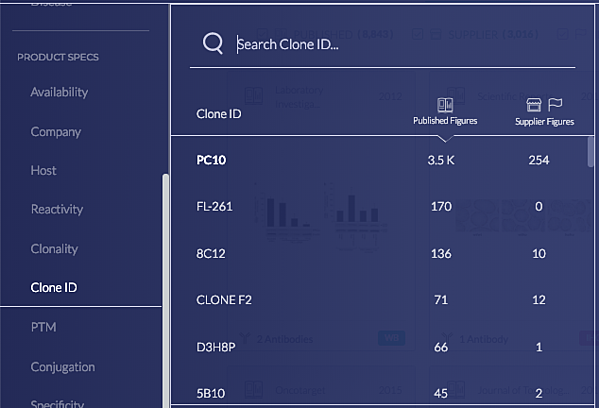 Because BenchSci is able to show literature-wide trends, you can open up the clone ID filter to quickly identify the popular clone ID for your protein of interest. Some scientists want to identify the most popular clone since it is the one that has worked most often for other scientists. Then, they can select a product from that clone with a particular conjugation or one from a trusted vendor. During validation of an antibody, you’ll often need a positive control cell line, tissue, or cell type in which the target protein is expressed. 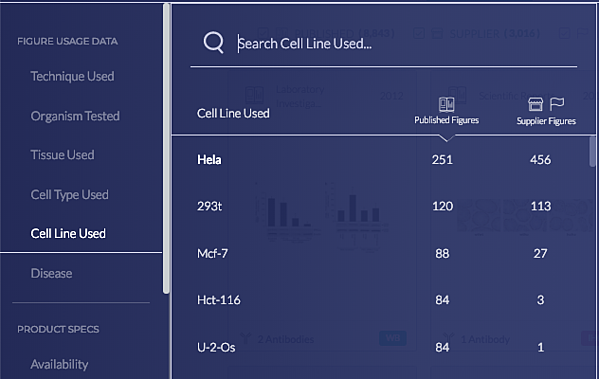 Instead of hunting through protein expression databases, you can open up our cell line, tissue, and cell type filters to see how the protein is most commonly studied to help you identify a positive control. Flow cytometry can be used to identify and quantify the cell types within a heterogeneous population. This requires a combination of antibodies (called a panel) that detect different protein markers expressed on some of the cell types but not others, to help differentiate among cell types. Start by applying the cell type filter for the cell type you want to identify, then the flow cytometry filter, and review the product results. 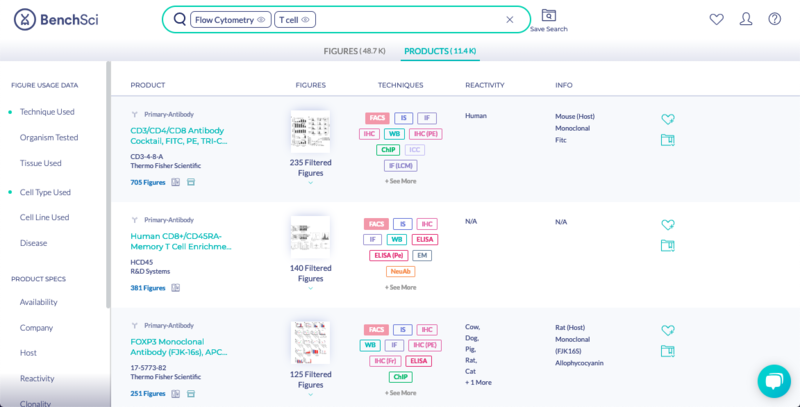 By looking through the product results, you can quickly see what proteins other scientists are targeting when they use flow cytometry to identify this cell type. This can help you find a protein to use in your flow phenotyping panel. After you’ve conducted your experiments, you can come back to BenchSci to benchmark your results. 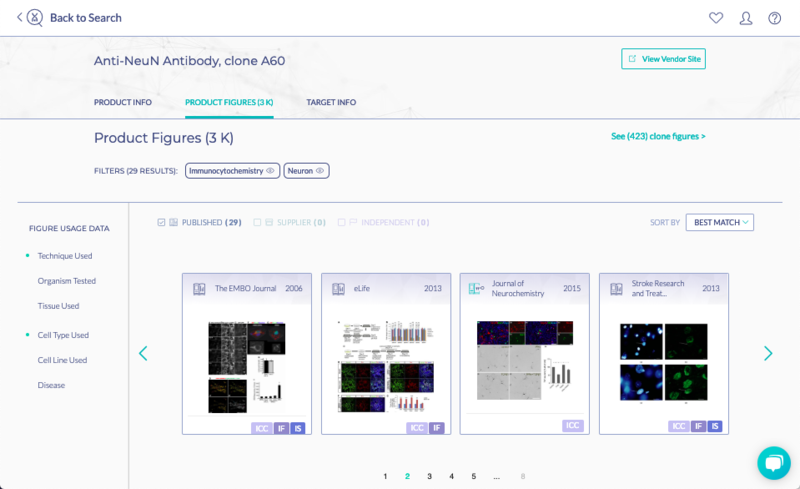 You can compare your results to similar experiments from the published literature where the exact same antibody was used by going directly to its product page on BenchSci. Here, you can filter down the figures by defining your experimental context and compare your results with what was previously reported. You can even take your benchmarking a step further by comparing your results to those in a different experimental context by changing up the filters. Tip: If there are no figures where the exact same antibody was used, you can try searching by protein instead. These are just a few examples of how you can use BenchSci for more than an antibody search, but I encourage you to get creative with it. Try out some of these new applications on your current project and let us know about your experiences in the comments!